There is a hero in my life: an unsung hero, named Sarah. She is my sister and my friend. I have to believe that she dons a cape under her clothing detailed with some sort of symbol that suggests my rescue and protection. She is careful not to draw attention to herself and keeps her cape tails tucked in tightly. If I thought I held an understanding of her powers before, it was an inadvertent underestimation. When it has mattered most, she stood strong – for me. Sarah is a creative marvel. She finds her happy, contentment, peace and confidence in creating, and it is more of a way of existence vs. hobby. We are cut from the same cloth. She is the inspiration for our project this week. 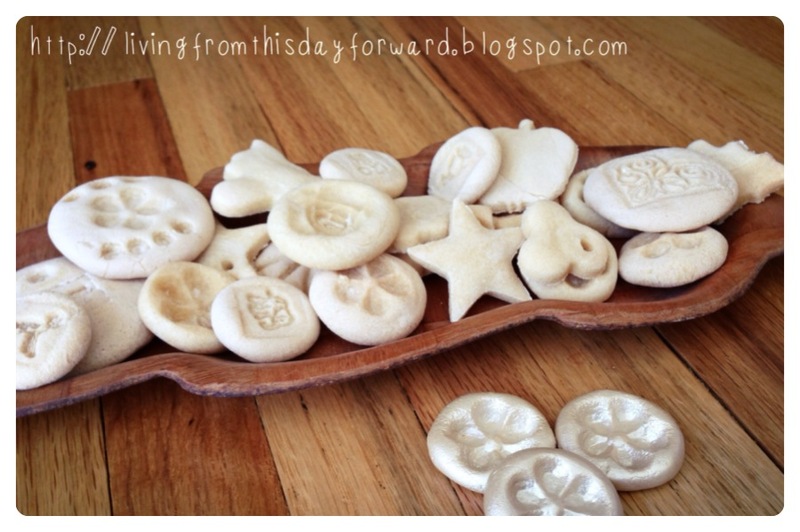 While brainstorming a craft to share with her Girl Scout troop, she recalled salt dough. 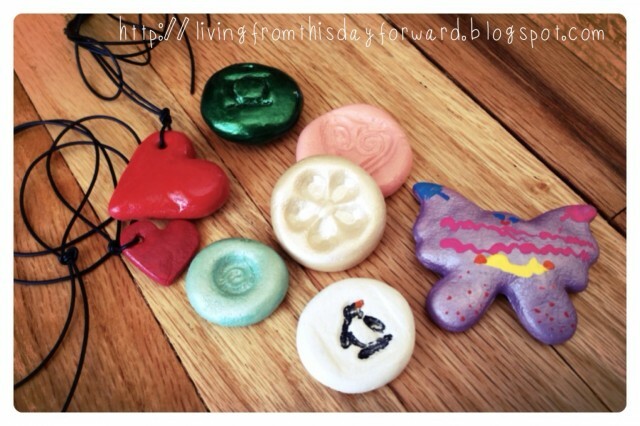 Growing up we played with salt dough and were gifted handmade Christmas ornaments shaped from it. She mixed up a batch and began to experiment with the pliable medium, her creative instinct driving her. Her beautiful daughters joined in the session resulting in treasures and tokens in various shapes and sizes: round coins with stamped patterns, plump hearts, and smooth coils. She added layers of detail and sparkle with paint and polish. What started out as a few inexpensive common household ingredients, became a unique treasure. I invited Sarah and her girls over for a creative session with cousins. Each of the children had their own unique ideas, and the results gave light to their individual imaginations. In a small-to-medium mixing bowl, combine the three dough ingredients until a ball forms. Start with half the amount of water listed above, and slowly add more as needed. Your goal is a smooth ball of dough that doesn’t stick to your hands or working surface. If your dough is too sticky just add a little more flour until it’s just right. Dust your work surface with flour to keep the dough from sticking. We found working directly on the cookie sheet to be a convenient method as well. When your dough is ready – dig into it! Your babes will love the way it feels in their hands. 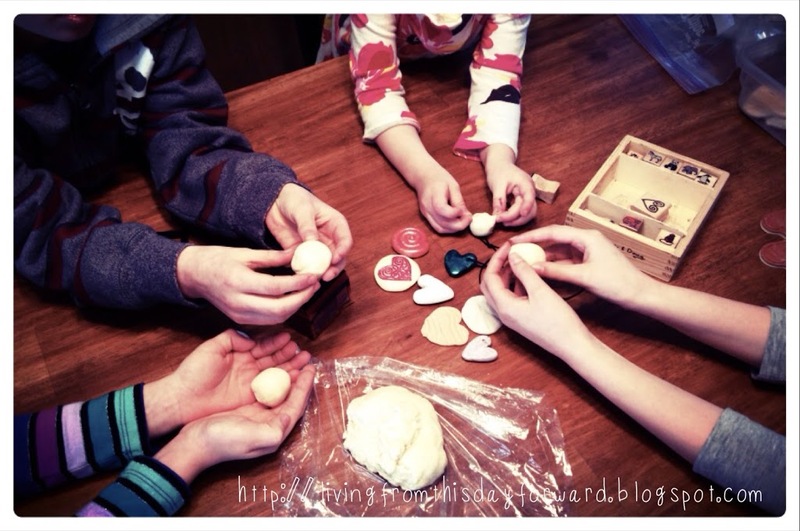 For coins (round tokens) pinch off a small chunk of dough and form it into a ball with your palms. Push or tap the ball down lightly and evenly to a desired thickness. 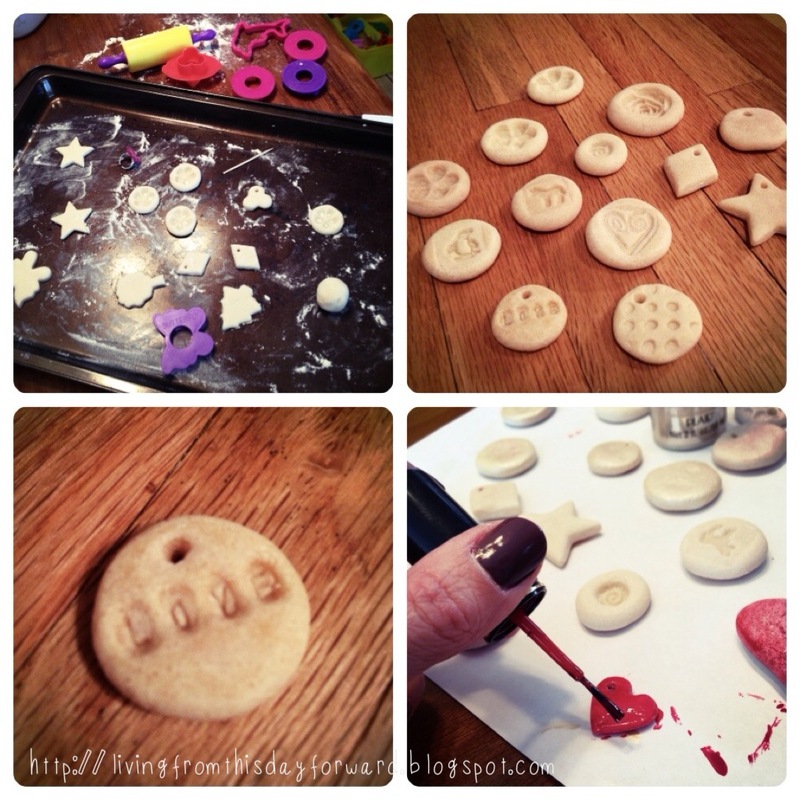 Use different objects to make an impression in the dough. We used rubber stamps, a flower costume ring, toothpicks points, and Legos for interesting prints. If you want to design a pendant for a necklace, poke a hole in the top of your objects with a toothpick. Make it a bit larger than the cord you plan to use – the dough swells a bit while cooking. 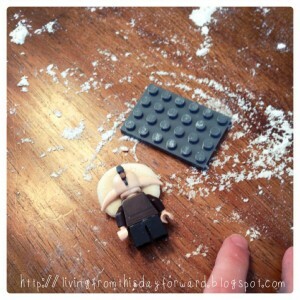 Lego man head = salt dough fail. 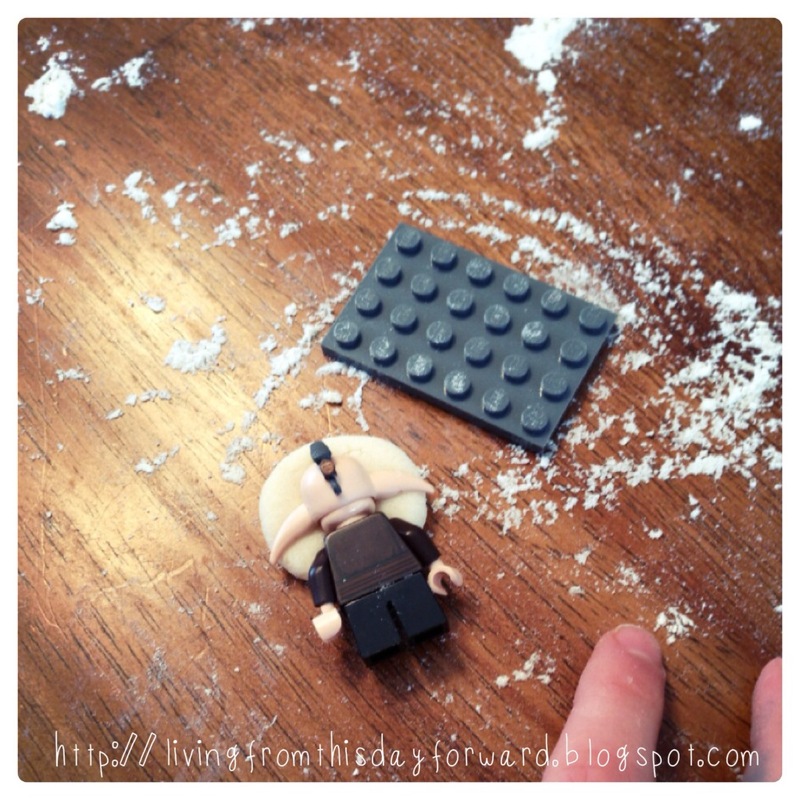 Lego plate = salt dough win! You can store your dough in the fridge for a few days if you have leftovers. Place your dough treasures on a cookie sheet and bake in the oven (250 degrees – or 200 if your oven runs hot) for about 2 hours. You want the dough to completely dry out and harden to prevent future molding. If it’s a bit spongy, it’s not ready. When they are dry and cool it’s time for embellishment. Sarah discovered that the ticket to a really smooth surface is to sand the object with a fine/light sandpaper before painting. You will feel the bumps or cracks begin to smooth out. Next, I sprayed them with a light coat of primer paint, to seal them a bit, but it’s not absolutely necessary. Decorate them with acrylic paint or try fingernail polish in thin even layers – making sure you allow enough dry time in between. Finally, I sprayed them with a light coat of clear poly spray paint. This just gives it a glossy coat if your paints leave a matte finish. Again – NOT a necessary step. 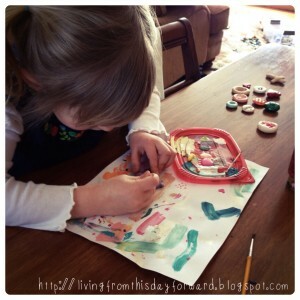 Adding detail is a great exercise in fine motor skills! 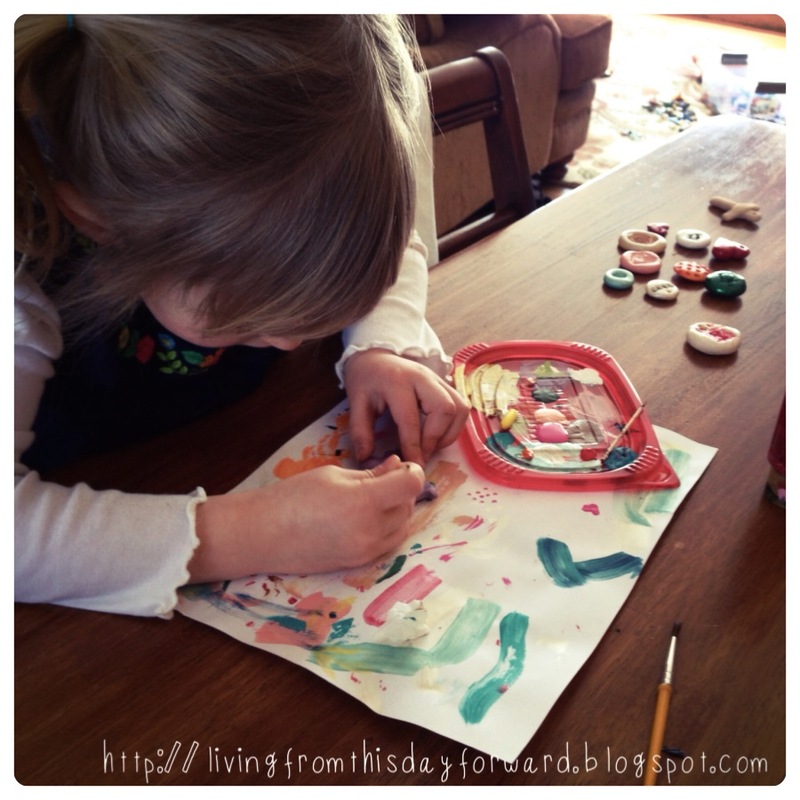 Thanks to Sarah for sharing such a fun project with us – Love You!